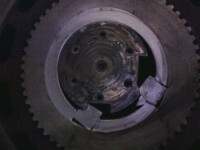 This picture was taken before we started the repair on one of two center pins. These pins were worn from many years of use. The repair consisted of building the material back up and then machining it back to size. This repair was done outside and on site at the customer’s place.The repair of the center pins consisted of rough machining approximately .060 per side. 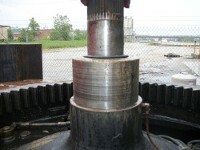 Preheating, weld build up one pass and post-weld treatment concluded by remachining. The picture on the right illustrates the center pin being remachined after the welding. 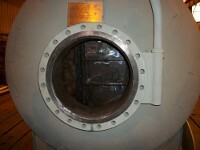 The finish product is in new condition and was repaired at about 10% of the replacement cost. The two center pins were finished in approximately one week, saving the customer costly down time.